WARNING: This article contains spoilers for the ending of Stephen King's The Dark Tower book series. Book-to-film adaptations can be tricky; Stick too closely to the source material and the movie could suffer, but stray too far from what you're adapting and you risk alienating the fans. 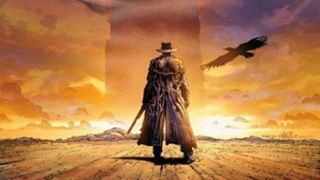 For better or worse, it looks like The Dark Tower movie will be going off-book, but that may not necessarily be a bad thing. King's tweet therefore implies that director Nikolaj Arcel's movie is more of a continuation than a direct adaptation, and it's a really smart narrative choice. Essentially, it allows for plenty of potentially fun changes between the book and the movie; it can be both a retelling AND a sequel to the books. Assuming there are no plans for more movies, it could also mean that the adaptation could provide a definitive ending to the saga. In other words...it's genius. Directed by Nikolaj Arcel, and starring Matthew McConaughey, Idris Elba, Jackie Earle Haley, Fran Kranz, Abbey Lee, Katheryn Winnick and Tom Taylor, The Dark Tower opens on February 17, 2017.